It's #NationalSoupMonth so Chef Emeril Lagasse, Laura in the Kitchen, ‪#‎Snapware‬ and I are participating in a Snapware Winter Warm-Up. Chef Emeril shared a delightful and comforting recipe of cream of tomato soup with fontina, mushroom, prosciutto and truffled grilled cheese sandwiches. The soup was easy to make and so delicious that even your kids will be double dipping their grilled cheeses in the creamy and flavorful soup! In the winter,, I try to enjoy soup everyday as it fills my belly and warms my soul. I suggest you try this recipe if you are one of the millions of us currently dealing with arctic temperatures. A huge thanks to Emeril, Laura, Snapware and Google Live Hangout Chat for having me participate in the live chat and sharing many delicious Winter warming soup recipes with me! That's me in the orange/red sweater along! Set a 3 quart saucepan over medium-high heat. Add olive oil and once hot, add the onions, carrots and celery to the pan. Saute the vegetables, stirring occasionally, until the onions are translucent and the carrots are soft, 4 to 5 minutes. Add the garlic to the pan and sauté until fragrant, about 30 seconds. Add the tomato paste, the tomatoes and their juices to the pan and stir to incorporate. Continue to cook until the liquid comes to a boil. Add the chicken stock and marjoram to the pan and return to a boil. Reduce to a simmer, season with the salt and pepper and cook until flavors are marries, about 30 minutes. Remove the soup from the heat and, using an immersion blender, or in batches in a bar blender, puree the soup until smooth. Return the soup to the heat and add the balsamic vinegar and heavy cream to the soup. Cook for 5 minutes, stir in the basil, and serve immediately with the grilled cheese sandwiches. Combine the cheeses and set aside. Lay 10 slices of bread out on a clean surface. Carefully fold 2 slices of prosciutto onto the bread being sure that the prosciutto does not reach over the edge of the bread. Lay between 9 and 12 slices of mushrooms over the prosciutto in 1 layer, and top with 1/4 cup of the cheese. Place a piece of bread on the top of the sandwich and brush with about 1 teaspoon of olive oil. Heat a grill pan over medium heat and once hot, place 2 sandwiches, olive oil side down on the grill. Brush the exposed side of the sandwich with another teaspoon or so of olive oil. Use a frill press or another pan to weight the sandwiches. Cook the sandwiches. for 2 1/2 minutes to 2 minutes, or until golden brown grill marks have formed and the cheese is beginning to melt. Turn to the other side and cook for another, 2 1/2 to 3 minutes, or until crispy and the cheese is melted. Remove from the grill and cut in a half diagonally. Continue to cook the remaining 8 sandwiches in the same manner. 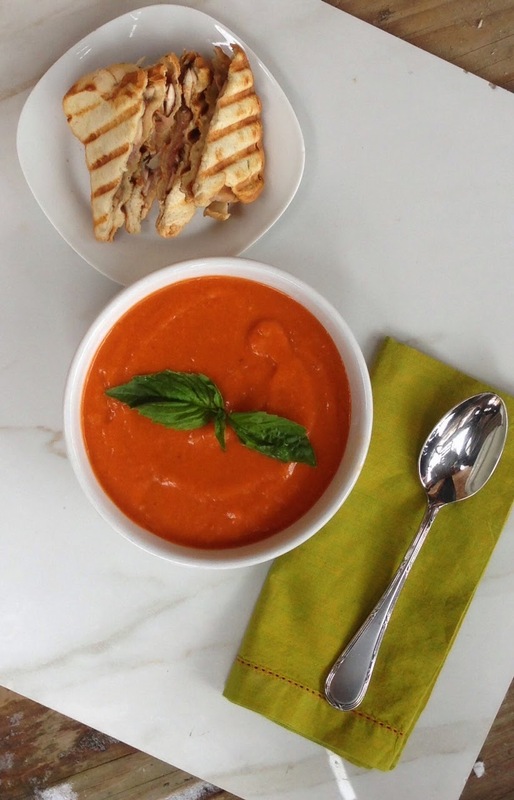 Serve each sandwich with a cup or bowl of the cream of tomato soup! ENJOY!